In March 2016 we won the contract to look after the Royal Naval Hospital West End, which is part of the Millfields Estate, Stonehouse, Plymouth. We must have impressed them, because we are delighted to announce that since then we have been invited to tender for, and won, a much larger area of the Estate. 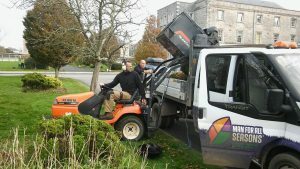 This is a huge contract of regular and ongoing garden maintenance and major enhancement, which will be keeping us very busy from now on! It’s an estate with a rich history and is comprised of a mixture of lots of different areas – some residential and some commercial. Over the years the estate has been divided up and different areas are managed by different organisations. We are now working with MEMCO (Millfields Estate Management Company) and Millfields CEDT (Community Economic Development Trust) to deliver top-quality gardening maintenance and enhancement services. This means we are now responsible for around 80% of this very special area of Plymouth. To start with there’s some initial catch-up work to be carried out, including trimming beech hedges that have not been correctly managed to get them back under control. The grass has not been very well-maintained, so we’ll be mowing and treating and working to improve the quality of the lawns. There are leaves to pick up, weeds to clear and ivy to be cleared from trees and walls. We’ll be working our way through the estate, improving the quality of the lawns, enhancing and replanting the beds and restoring it to look like the heritage site that it is. We are really pleased to take this work on and will post regular updates as things progress! If you have garden maintenance requirements, whether large or small, give us a call to find out how we can help.